Replacement:DEV-12076. 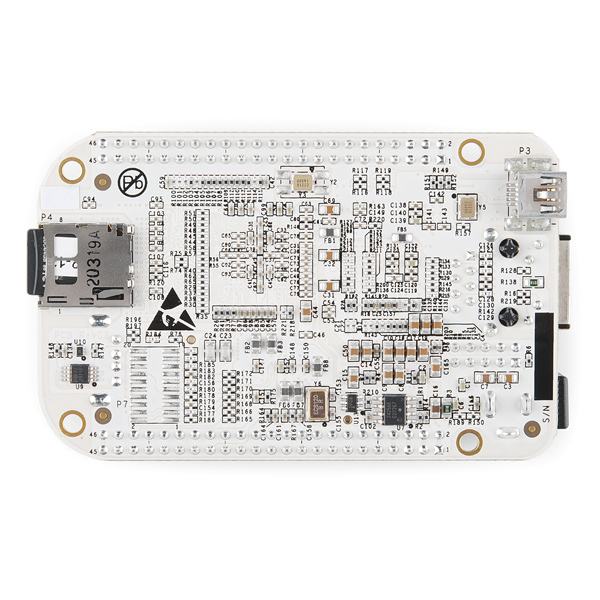 The new Beaglebone Black is now available, go check it out! This page is for reference only. The BeagleBone is a low-cost credit-card-sized Linux computer from BeagleBoard that connects with the Internet and runs software such as Android 4.0 and Ubuntu. 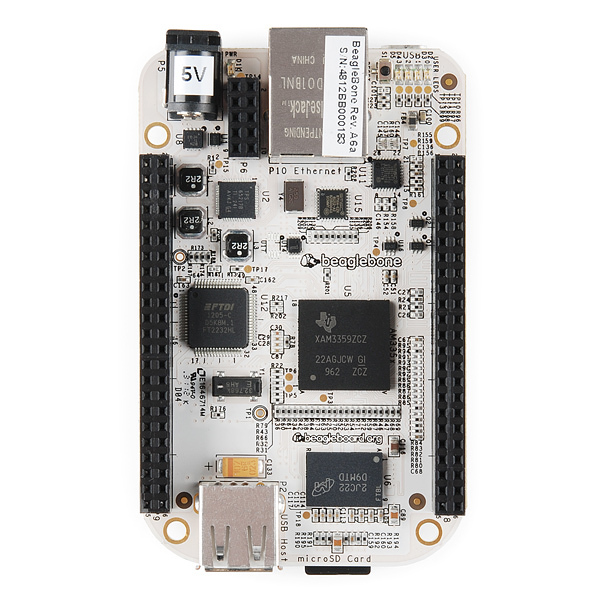 It's smaller and lighter than their other boards like the BeagleBoard-xM and while it may not have quite the processing power that their large model does, the BeagleBone is perfect for physical computing and smaller embedded applications. On-chip Ethernet and access to low-level peripherals like analog-to-digital converters give the BeagleBone the upper hand in expansion. With plenty of I/O and processing power for real-time analysis provided by the TI Sitara™ AM335x ARM® Cortex™-A8 processor, BeagleBone can be complemented with cape plug-in boards which augment BeagleBone’s functionality.They're called capes because Underdog is a beagle and he wears a cape. Makes sense, right? At over 1.5 million Dhrystone operations per second and vector floating point arithmetic operations, BeagleBone is capable of not just interfacing to all of your robotics motor drivers, location or pressure sensors and 2D or 3D cameras, but also running OpenCV, OpenNI and other image collection and analysis software to recognize the objects around your robot and the gestures you might make to control it. Through HDMI, VGA or LCD expansion boards, it is capable of decoding and displaying multiple video formats utilizing a completely open source software stack and synchronizing playback over Ethernet or USB with other BeagleBoards to create massive video walls. If what you are into is building 3D printers, then BeagleBone has the extensive PWM capabilities, the on-chip Ethernet and the 3D rendering and manipulation capabilities all help you eliminate both your underpowered microcontroller-based controller board as well as that PC from your basement. 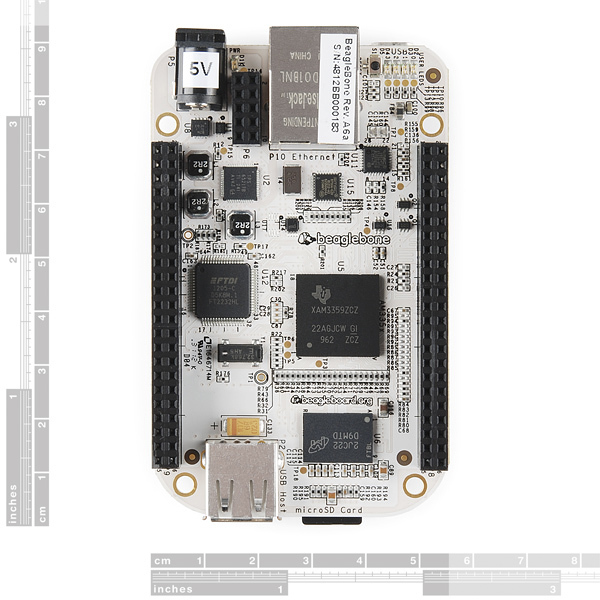 No word about new BeagleBone Black, at SFE. With higher performance application processor at 1GHz, on-board micro HDMI for direct monitor/TV connection, 512MB DDR3 and 2GB eMMC, it will be very successful product. Should we expect it on stock any time soon? Like BeagleBone though still eyeing for BBB. But I'm stuck with my curiousity Why is BB Black (45$) a much cheaper than BeagleBone ? does BBB is less capable? I'm looking for something more processing power over my Arduino for embedded application (I'm not after really on video capability) such as robotics and home automation. Just wonder if BBB will give it a kick. When do we expect to see the BBB? In my experience when you hit that wall, it's usually time to make everything 3.3v. Not practical in this instance, dealing with already made boards that have been out in the field for years. Older / slower units will have to do. why I just receive a MicroSD card with 70.4 MB space??? If you had a problem with your order please contact techsupport@sparkfun dot com. They'll be able to assist you further. What revision is this board? I am thinking about configuring BeagleBone with Ubuntu and ROS with OpenCV modules. Any advice on how to proceed is appreciated. This little board is indeed very powerful, even though I'm an entry Linux user, and have no experience programming under it, my previous history with Python led me in to coding up couple intricate scripts, that proven to be fairly reliable. Wish that Angstrom fork dev's will include Cloud9 Python debugging and execution.